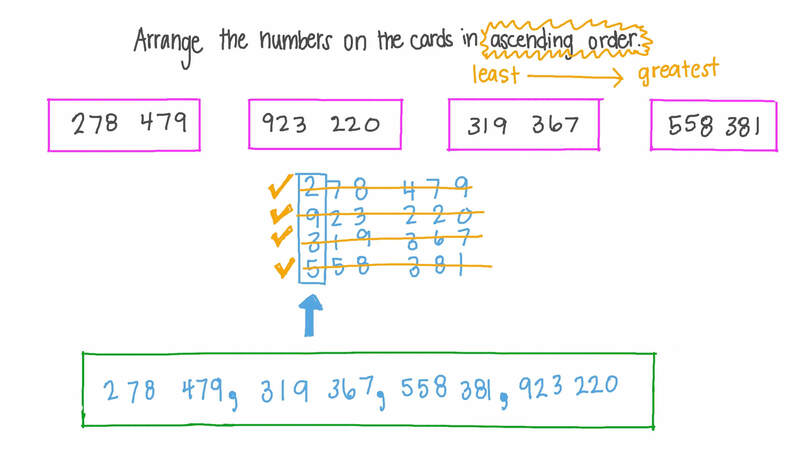 In this lesson, we will learn how to arrange whole numbers through millions in ascending and descending order. Arrange 1 7 3 6 2 1 4 0 0 , 3 1 1 8 7 2 9 3 3 , 9 2 3 4 4 6 6 2 5 , 7 0 4 0 4 9 4 0 7 in ascending order. Arrange 132 833, 212 604, 275 566, 787 478 in descending order. Arrange 7 7 6 1 3 9 7 0 , 7 1 8 7 0 1 5 4 5 , 3 9 2 4 3 4 4 3 0 , 7 6 2 8 1 6 3 5 3 in descending order. Add the biggest number and the smallest number in this list: 42,065, 39,180, 85,633, 57,636. Arrange 8 2 1 6 0 4 4 4 9 , 5 1 5 0 1 3 6 3 9 , 2 6 9 0 8 6 1 9 5 , 2 5 5 5 7 5 6 2 1 in ascending order. Arrange 7 8 7 0 9 2 7 9 , 4 7 0 5 7 8 2 4 3 , 2 3 2 5 7 4 9 0 8 , 8 5 4 0 3 6 0 7 6 in descending order. Arrange 9 3 2 1 8 5 7 2 , 4 7 2 7 1 7 1 0 9 , 2 4 9 0 6 0 5 0 4 , 9 2 7 1 7 8 7 3 7 in descending order. 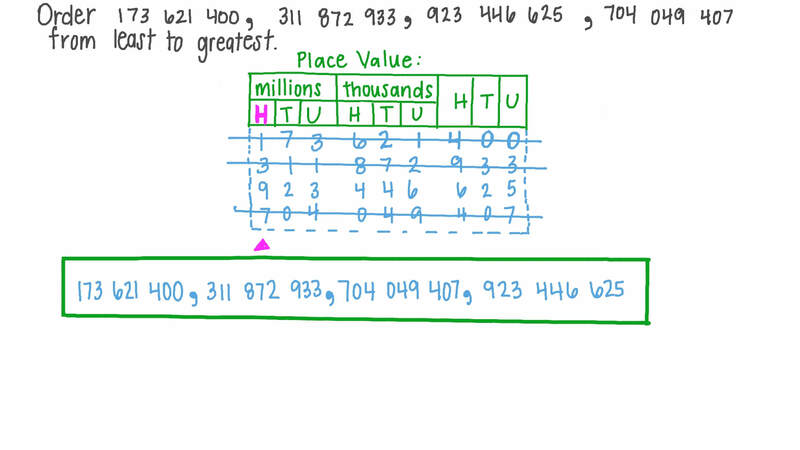 Arrange 3 1 0 2 0 7 4 4 6 , 9 5 7 2 3 6 4 5 , 9 7 4 1 7 6 5 7 0 , 7 4 7 9 9 1 8 2 2 in descending order. Arrange 322 743, 533 086, 944 798, 903 822 in descending order.